Will Varicose Veins reappear? Do i have them for life even after treatment? If you have the underlying cause (usually reflux) treated and the large veins removed (microphlebectomy), they will not recur. However, this is an inherited condition and it is possible that there could be other veins in your legs in which the valves fail, causing them to dilate. Yes, there can be new veins that require treatment. There is a recurrence rate after varicose vein treatment but a lot depends on the experience of the treating physician. The goal is to remove ALL sources of reflux. Once this is done, the chances of recurrence are significantly reduced but you still will need periodic follow up. Once, varicose veins are removed they are gone forever, however, you could form new varicose veins elsewhere. As for treating the underlying cause, over 90% of the time a vein is ablated (closed down) it remains closed. Patients with varicose veins have a predisposition to forming varicose veins. Therefore, despite treatment, you will always be predisposed to having varicose veins. However, once a varicose vein has been removed or ablated by sclerotherapy or laser... it is gone! It can never return. It is dead or removed from the body so how can it return? 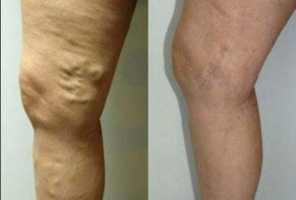 It is possible for a new vein to go bad and appear, even in the same area as the old vein. I often tell patients that it is like having bad teeth. You can fill a cavity or pull a tooth, but it doesn't mean another tooth may not go bad years down the road. In my practice with over half a million patients over 20 years, we have found that only about 25% of patients have another vein that needs treatment withing half a decade. Different veins can recur over time, after treatments, however the ones treated will be gone after a successful treatment. Patients with varicose veins have a predisposition to forming varicose veins. Therefore, despite treatment, you will always be predisposed to having varicose veins.